Group News Blog: Sarah Palin Rules Out Running for Senate "the White Hot Spotlight" is Not Appealing? Sarah Palin Rules Out Running for Senate "the White Hot Spotlight" is Not Appealing? Looks like Caribou Barbie is not going to run for Senate. More money in Media? More easy money in the Alaska budget? Or does she have someone else in mind for that seat? NEW YORK (Reuters) - Former Republican vice-presidential candidate Sarah Palin says she is not interested in running for the U.S. Senate and prefers her current position as governor of Alaska. "No, I'm not planning on it because I think the people of Alaska will best be served with me as their governor," Palin, who has two years left in her term, told NBC television in an interview. Interest in the 44-year-old first-term governor has remained intense since she and Republican presidential candidate John McCain lost the election to Democrat Barack Obama and his vice presidential running mate Joe Biden a week ago. She has granted several television interviews since then. Palin has been mentioned as a possible presidential candidate in 2012 or a possible contender for the Alaskan U.S. Senate seat held by Ted Stevens, who may be forced out of Congress because he was convicted of seven felonies for failing to report more than $250,000 in gifts. 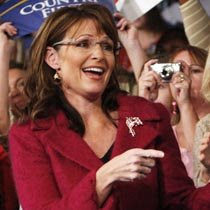 "You know, when you talk about that white hot spotlight -- that's not really attractive to me," Palin said about running.